Intense concentration, motorsport mastery, and sheer precision are the thresholds of the Nürburgring. To conquer the famed Green Hell, you need more than luck on your side. You need complete protection from Pennzoil® PurePlus® Technology under the hood of a high-performance sports car: the BMW M4 CS. Built with an inline six-cylinder M twin turbo power engine and driving at a top speed of up to 174 mph, the BMW M4 CS is the embodiment of performance. For BMW M sport road cars, M stands for continuous success in motorsports and building high-performance road-legal vehicles. M also represents power—the exact force needed for the BMW M4 CS to drift and conquer one of the most challenging racetracks in the world. The BMW M4 CS relied on Pennzoil® PurePlus® Technology to bring complete protection for top engine performance on the world-famous Nürburgring. Pennzoil is the recommended supplier of genuine BMW Engine Oil in North America, and that’s why the BMW M4 CS has the engine wear and temperature protection needed to reach its full potential. Precision driver Rhys Millen was the steering power behind the wheel of the BMW M4 CS. With over 20 years of racing experience, Pennzoil trusted Rhys Millen to pilot the competition sports car in the performance of a lifetime. A paved race track curves through a course situated in a grassy valley flanked by low-lying mountains. MAN'S VOICE (OFF-CAMERA): And cameras rolling. And action. Action. Car tires squealing and engine revving. A yellow sports car speeds along the track. Next, the car briefly becomes airborne as it zooms from off road onto sharp curve. A keyboard plays synthesized violin sounds and arpeggiated piano notes in a minor key. Inside a yellow oval, "Pennzoil" is written in black letters across a red Liberty Bell. Underneath the logo in yellow uppercase letters: "SYNTHETICS." "Pennzoil SYNTHETICS Presents…"
MAN'S VOICE (OFF-CAMERA): This is Nürburgring. A medieval castle stands atop a tree-covered hill. MAN'S VOICE (OFF-CAMERA): One that everyone dreams of to drive this way. The yellow car speeds around a u-shaped bend in the track. "Behind-the-Scenes Look at Escaping the Ring." MAN'S VOICE (OFF-CAMERA): This is the green hell. In the racetrack parking lot, a brown-haired man sits in a folding chair in front of the yellow BMW. Behind the car, an SUV mounted with a rooftop camera crane sits beside a tractor-trailer truck. "Rhys Millen -- Precision Driver." RHYS MILLEN: And what did we do? Everything that everyone has dreamed of. The BMW skids sideways as it zooms around a curve. RHYS MILLEN: We drifted the track. We drifted the carousel. Gripping the steering wheel with both hands, Rhys smiles as he drives the BMW along the racetrack. RHYS MILLEN: We did every fan's dream day at Nürburgring. And I got to do it. It was awesome. Sitting in the folding chair, Rhys smiles and nods. Next, large separate red letters hanging on a gray corrugated metal wall spell out "Nürburgring." A brunette woman stands behind a railing beside the racetrack. "Erin McGivney, Account Director, J. Walter Thompson." ERIN MCGIVNEY: Germany is an interesting location, because it really embraces the car culture. You come to a place like the Nürburgring, which is such an iconic racetrack, and you just see the true love of cars by people here. Everybody wants to get on this track. Everybody wants to drive it. So, to be in such a special place and have it as the backdrop of our next film is really exciting. The BMW speeds along a tree-lined section of track, then skids diagonally before driving over a red-and-white striped curb with the left tires and back onto the track. Next, a brown-haired man with a close-cropped beard sports an olive-colored military-style cap and a white t-shirt as he sits in a chair near the yellow BMW. "Trevor Cawood -- Creative Producer, Lemonade Films." TREVOR CAWOOD: In all of the Pennzoil films, since day one, we always set out with a simple goal, which is we try to shoot the car with the most energy -- the most kinetic way possible, the most adrenaline-filled possible. Exactly what drivers would want to do if they had the world's best supercars at their hands. A crew in a car with a rear-facing camera mounted to a crane films the BMW as it speeds up from behind. Next, smoke billows up from the tires as the BMW skids around a sharp curve. In an indoor arena, a short-haired young man in a green t-shirt sits on a balcony overlooking the main concourse lobby where people stroll past cars on display. "Ozan Biron -- Director, Lemonade Films." OZAN BIRON: So, in order to play with a high-performance car, we need high-performance toys. We're using high-performance pursuit vehicles to keep up with this. The BMW speeds up beside the camera-mounted car. Next, a crew member attached a small camera to a pole mounted on the front driver's side of the BMW and points the lens at the lower half of the front driver's-side tire. OZAN BIRON: It's very demanding. So, we're playing with both worlds -- high performance in camera, and also high performance behind the camera. The BMW slides sideways as it rounds a curve. Next, Rhys talks with the film crew in a garage lit with fluorescent lights. Elsewhere, a bespectacled man with short, graying hair watches video footage on a computer monitor resting in the back of an SUV. Trevor Cawood sits near the parked BMW. TREVOR CAWOOD: We have some of the most talented, creative, artistic filmmakers on our shoots from around the world. We approach these spots differently than conventional automobile advertising in that, instead of making the car look as beautiful and fashionable and sort of artificial as possible, we go the other way. Leaning against the railing beside the racetrack, Rhys smiles and high-fives a crew member. TREVOR CAWOOD: We try to make the car feel as real and grounded and believable as possible. Standing on a racetrack terrace, Rhys crisscrosses his downward-facing palms as he talks to Ozan. Next, Ozan sits on the balcony overlooking the arena lobby. OZAN: Every car that we've filmed always has to have a different approach. And every time, we always try to reinvent the wheel in terms of how to show that, and bring that to other people out there and show that type of performance. And for me to visually express that within each car is, at least in my world, it's amazing. Standing on the racetrack, Ozan holds up a map of the racetrack. A helmeted driver wearing a green jacket bearing a Pennzoil patch on the right sleeve zooms along a narrow, tree-lined road. On a black background, the yellow Pennzoil logo appears out of a flash of light and a wisp of smoke. Beneath the logo in uppercase white letters, words rotate and transform into other words: "Synthetics…Complete Protection…For Top Engine Performance…Make The Switch." The Pennzoil Logo--a yellow oval with "Pennzoil" written in black letters across a red Liberty Bell--appears against a black background. In a vast complex with high ceilings, a metallic letter "M" curves outward from a tinted window. To the left of the M are three vertical stripes: light blue, dark blue, and red running from left to right. A man's voice: "M stands for continued success in motor sports…"
Viewed from outside, a section of the ultra-modern complex features curved, highly reflective walls. The Technology Behind The BMW M4 CS. "…and also for high performance agile road legal vehicles." A close-up of the M logo and stripes adorning an engine and the back of a yellow sports car. "M stands also for the most powerful letter in the world. The M4 CS is the newest model in our product lineup. Performance of the car is from 0 to 62 miles per hour, 3.9 seconds. So, quite fast." Peter Quintus, VP Sales & Marketing, BMW M GMBH. "The M4 CS is fitted with the inline six cylinder engine, with two TwinPower Turbo. Basically it's the M4 GTS engine but without the motor injection. The top performance of the engine is 460 horsepowers, and the top torque is 442 pound foot. " The car speeds down a road. Standing inside the complex, Peter leans against a metal railing overlooking cars parked on a lower level. "For a high performance sport car weight is a very important factor, so we actually build a lot of carbon parts into the car. So, for example, the hood is made of carbon, the roof, the rear diffuser, and many other parts." Viewed from above, the speeding car leaves a trail of white smoke as it skids across the pavement. A disclaimer appears in small white letters at the bottom of the screen: Professional driver on a closed course. Do not attempt. Respect all traffic laws and never drive recklessly. "All our cars have to--tested on the Nürburgring. The timing on the Nürburgring is very important; it shows the quality of the car." The car whizzes down a track curving through a densely forested landscape. "The M4 CS did time of 7.38 minutes, which is basically in the super sports car segment." The car takes a curve at high speed. "The motor oil plays a very important role in our cars. All our cars have the requirement that they can compete in a race around 40 rounds without any problems, and that at the outside temperature of 104 degrees Fahrenheit. This means, uh, a high stress for the engine and also means you need a top quality of motor oil. Basically we have very high revs in our engine, so 7,500 rpm at the top, and also relatively high temperatures when the car is doing a race." The car kicks up smoke as it drifts around a curve. "So that means for a--a engine oil we need high shear stability and we need also top stability on the viscosity side. We need top quality oil because the oil has to be stable in between the service intervals. If that's not the case, we will have high wear in the engine and also there's even the possibility that the turbochargers gets damaged or lose the engine--even a failure of the engine. So wear protection is very important for us." In close-up, a hand pours oil into a funnel inserted in an engine. The label on the bottle reads: Original BMW Engine Oil, Twin Power Turbo." "The Original BMW Engine Oil is made of Pennzoil PurePlus technology, which means the oil is made of natural gas and not crude oil. This delivers exceptional quality in regard of viscosity, engine performance and engine protection for M and BMW road cars." A close-up of the thick, white smoke billowing from the speeding yellow sports car as its wheels spin on the track. The Pennzoil Logo against a black background. Smoke billows from the rear tires of a yellow BMW sports car. A synthesizer plays fast high notes punctuated by long low notes. MAN'S VOICE (OFF-CAMERA): We're out here in the Nürburgring in Germany. In bold uppercase yellow letters: "POWERING The BMW M4 CS." MAN'S VOICE (OFF-CAMERA): Here, all the OEM's, all the manufacturers have test facilities and they're all out here pushing their vehicles to the limits. The BMW speeds around a curve. MAN'S VOICE (OFF-CAMERA): It's also the perfect proving grounds. A clean-shaven man wearing a black cap bearing the Pennzoil logo sits near the parked BMW. "Jeremy Jones -- Executive Creative Director, J. Walter Thompson, Atlanta." JEREMY JONES: Out here with the BMW M4 CS for Pennzoil to prove their technology." The BMW sits diagonally inside a slight curve on the tree-lined section of racetrack. Next, Rhys Millen, a man with short brown hair. RHYS MILLEN: You go through the specs of this M4 CS. The BMW's raised hood reveals a pristine engine. RHYS MILLEN: You've got 460 horsepower, 442 foot-pounds of torque. A 7-speed semi-automatic transmission with paddle shift on the steering wheel. Wearing a black hoodie and a black t-shirt with the Pennzoil logo on the right sleeve, Rhys drives the BMW along the racetrack. RHYS MILLEN: It's pretty much a dream sports car off the showroom floor. A man with short light brown hair stands on a walkway beside the racetrack. "Rhett Kearsley -- Senior Agency Producer, J. Walter Thompson, Atlanta." RHETT KEARSLEY: So, what you'll see in this film is how Pennzoil PurePlus technology allows the BMW M4 CS to reach its full potential. The BMW zooms onto the racetrack. RHETT KEARSLEY: You're going to see its speed, its handling and its M Sport's heritage. The BMW speeds along a tree-lined road. Next, wearing a Pennzoil baseball-style cap, a bespectacled man with short graying hair sits near the BMW as two men unload camera equipment from a truck and mount it on the sports car. "Fernando Morales -- Global Marcomms Manager, Shell/Pennzoil." FERNANDO MORALES: As all BMW M-models, it's a symbol of performance. And many people might not know this, but Pennzoil is the recommended supplier of the original BMW engine oil in North America. A man pours "Twin Power Turbo SAE DW 30…Original BMW Engine Oil" into the BMW's "M-Power" oil tank. FERNANDO MORALES: We are also a premium technology partner of BMW Motorsports. The BMW slides diagonally around a curve, sending plumes of thick white smoke billowing from the rear tires. FERNANDO MORALES: Performance is in Pennzoil's DNA. Whether it's in supercars like this one or in people's daily drives, we try to create products that allow drivers to get the most out of their engine. Performance is the fact that our technology is helping racing teams win championships. The BMW briefly becomes airborne as it zooms from off road onto sharp racetrack curve. Wearing dark sunglasses, Jeremy Jones sits near the parked BMW. JEREMEY JONES: Pennzoil's all about high performance--pushing vehicles to the limits and proving their technology. The BMW speeds along the winding racetrack. JEREMEY JONES: So, whether that's horsepower protection, wear protection or extreme temperature protection, that's what Pennzoil is all about. The needle on the BMW's tachometer swings past "seven" then back to "six" as the car speeds past a building bearing a huge red-lettered sign: " Nürburgring." Fernando sits near the parked BMW. FERNANDO MORALES: To me, there's no better product demonstration than seeing our technology perform in this car in the racetrack of racetracks--the Nürburgring. The BMW M4 CS speeds around a curve and along a straight section of track. Pennzoil took a high-performance sports car and powered one of the most legendary performances to date. 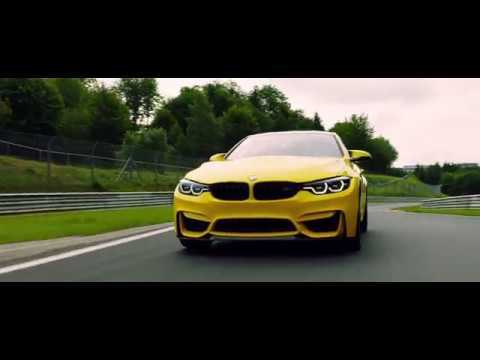 Watch Pennzoil® PurePlus® Technology push the BMW M4 CS to the limit on the world-famous Nürburgring in Escaping the Ring. See why Pennzoil is the Premium Technology Partner of BMW Motorsport. With more than 20 years racing experience, Rhys Millen has carved out a solid career and reputation, becoming one of the most sought after performance divers in the motion picture and U.S automotive scene.